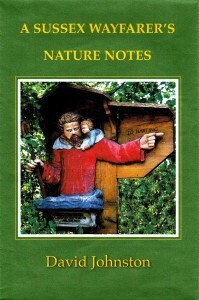 ‘A Sussex Wayfarer’s Nature Notes’ is made up of a collation of country diaries, which David began in 1987 – With his wife Sue he would set out at every opportunity to walk, and enjoy the Sussex countryside. And on those nomadic wanderings, David would note all they encountered – the animals, birds, flowers and reptiles in any particular area. On arriving home, he would jot down these country observations. In addition, David also recorded the interesting old farm buildings they discovered; the old shepherd huts; redundant farm machinery, and in fact, any curious artifacts they came across. Also, the many country people they met and spoke to – from old Sussex farmers – to country rustics – with snippets of conversation had with them. Then there are the events – the great storm of 1987, and the change it made to the countryside – also the floods; the snow storms – and the weather that he kept a note of each day. The David R. G. Johnston Collection of West Sussex Landscape Photographs.